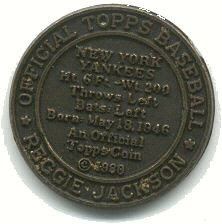 Today my thoughts turn to baseball coins. No, not the colorful 1964 inserts or the gaudy 71's. My focus today is on an obscure 1980 issue minted in limited quantities about which little is known. Sadly, I will not add too much to the commentary but rather take this opportunity to cast about for information. They are said to be 1 3/8" in diameter. I had a scan of Carew but it went with one of my hard drive meltdowns. 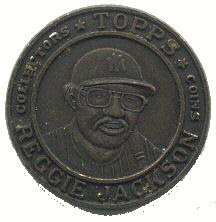 I believe Carew was silver in color and in addition to what looks like a bronze Reggie, gold is also rumored to exist. There is a tantalizing hint in the Standard Catalog that they have been found with holes in the top but I'd like to see a scan of that phenomena. Pricing in the Standard Catalog seems low as I recall Carew went for around $700 a couple of years ago and the '09 SC has 'em for a small fraction of that amount . Beauty is in the eye of the beholder I guess! I have to think more exist and so ask my intrepid readers for assistance. A little while back (St. Patrick's Day to be exact) I posted on the 1978 Topps Zest set. A short, Spanish language themed set, it is one of my favorites from the 70's. 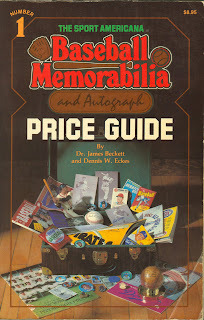 As we enter the dog days I plan to revisit some prior posts while I work on a long, long piece on 1951 Topps baseball cards and what better place to start than here. It's hard to tell from the scan but each sheet appears short by two rows. I have no idea what the missing 22 cards are on each sheet but thought they looked pretty cool! 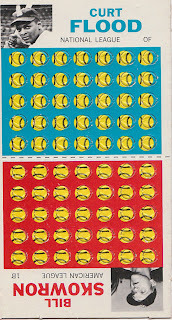 That's 44 of each card in the set spread over these two (partial) sheets. Anyone have an idea on the missing rows? Today's post just about came pre-written and gift wrapped, courtesy of Jeff Shepherd, who provided all of the scans. Why is the back so awesome? 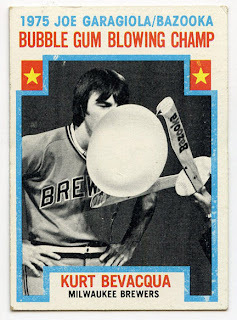 D) The A's had to use a substitute bubble blower! Now I had always assumed each player in the finals just had his best bubble measured in spring training by Sy Berger or something like that. Little did I know this was a highly organized event! I find it hard to believe the contest was so complicated! 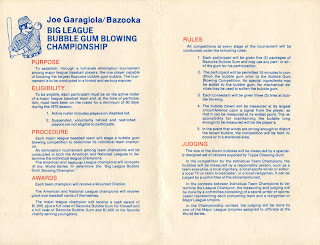 Among other things, the rules state: "The tournament is to be conducted in a formal and serious manner." Yeah, sure...... The winner got a thousand bucks and a case of Bazooka, as did his favorite charity. The man with the calipers sure looks formal and serious....geez, lighten up Bud! 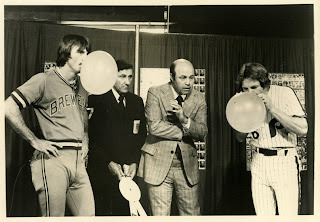 What you are seeing above is Joe Garagiola (he was a major TV personality at the time on NBC) watching the final blowdown between eventual winner Kurt Bevacqua of the Brewers and Johnny Oates of the Phillies. 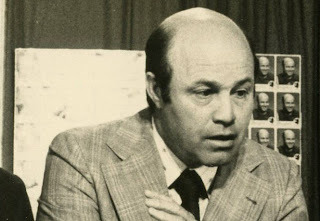 That, ladies and gentlemen is Garagiola's ersatz 1973 Topps business card. I think it highly likely said pasteboards were created for him to hand out at this event. 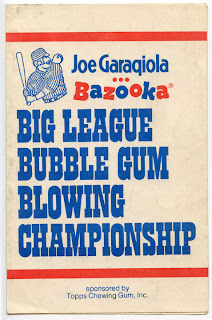 The card does have a 1976 copyright on it and I have to think the contest was held after the end of the '75 season based on the Joe G. card copyright date. There is more at this site though I'm not certain all the facts presented are correct. 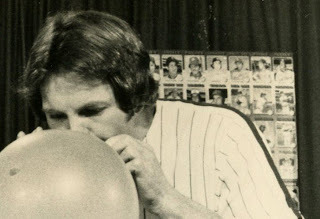 In addition, the contest rules state the player had to have spent 30 days on an active major league roster in 1975. I wonder how long this was actually held as an annual event? I receive a few e-mails and messages every week concerning what is posted here, all of which are complimentary and courteous, which I appreciate greatly. Most communication seems to lead to new discoveries or re-examination of prior posts or accepted hobby wisdom but some are just everyday inquiries. 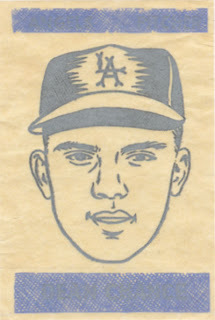 So when intrepid reader Lance K. sent me a note asking about a checklist discrepancy in the 1965 Topps Hot Iron Transfers, I thought there was nothing new to learn about this set and I'd just send along a link to a listing somewhere. Wrong! 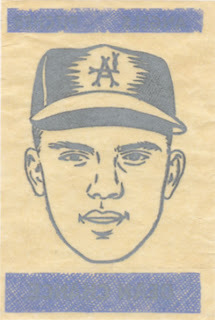 The Hot Iron Transfers were thin, fragile paper inserts with a player portrait meant to be ironed onto a T-shirt by your Mom in 1965. 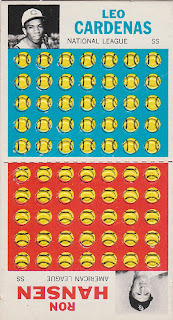 They were inserted in Topps mid-series nickel wax packs (and probably cello as well) that year, following the run of Embossed cards that came with the first couple of series. 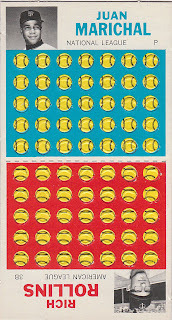 There are 72 Transfers in the set and as you will see below, they are really just simple line drawings with a team block atop and a name block below the portrait, either in blue or red. 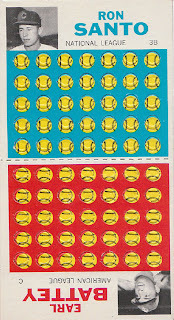 Colors alternate between the leagues, unlike the embossed cards which follow a strict Blue for AL, Red for NL pattern. From what I've found online, there are 72 total in the set, with 24 each released in the three series that year. Easy enough to answer, right? I check my sources and they reveal no details on series distribution. A quick Ebay search then shows they definitely came in the 4th and 5th series packs, while the Embossed cards have been seen with 1st and 2nd series packs. Not knowing what came in the 3rd series, which doesn't matter much anyway since Topps blended their series' as they were issued, it certainly seems plausible the Transfers could have come out 24 at a clip. I'll have to defer judgement on that due to lack of current evidence but I had merely assumed they all came out at once. It makes sense Topps would stagger the release of their inserts though, avoiding constant repetition in order to let the kiddies find new faces would be a good marketing move. According to a few checklists I've found, including Beckett, there are two Dean Chance transfers, numbered 10 and 42. Unfortunately there don't seem to be any scans listed as #42 anywhere. I've picked up a couple of #10 over the years, and they appear to be identical to every scan I've found online. I'm at the point where I'm wondering if 42 really exists. 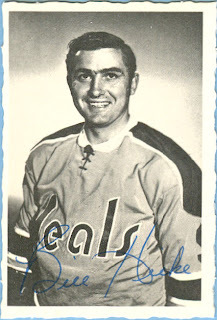 Going back to the listing, I note that Beckett and Eckes were looking for information on the 72nd card. Furthermore, the listing seems to cover the blue Transfers first, then the reds, so Dean at #10 makes a lot of sense and we already know it's ol' Bob at #41. So at some point the final Transfer was discovered and added to the list somewhere between Dean and Bob, bumping Bob to #42. From what Lance says, some checklists still are incorrect to this day, including Beckett's which would have been derived from the Sport Americana list. Well, Topps inserts are not really the focus of many collectors and I have to say the Transfers are not all that easy to find but it's a little surpising information on this set is still in error in some quarters. Well, that's why I write this blog. I really can't see too many kids doing this, can you? I wanted a copy as Mr. Stirling had created his own coding system within, essentially a modification of the ACC system; something I had known about since the early 80's and wanted to take a gander at. Finding a copy of the book was nigh on impossible in the pre-internet days but we live in wondrous times. Mission accomplished times two! After availing myself of the Stirling system nomenclature, I was leafing through the book (as I am wont to do) and found a few references that will lead to further posts here in short order. 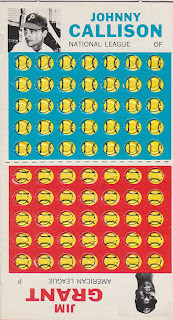 The most amazing entry though, was one concerning the very rare 1970 Topps Cloth Baseball Stickers and I thought a quick look at this esoteric set was in order. 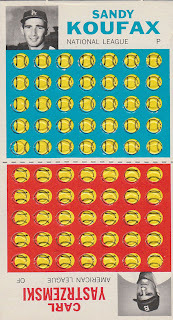 Almost certainly undertaken as a materials test, these stickers are taken from a second series (#133-264) sheet. Most mainstream checklists over the past 10-15 years had the set checklist at about 15 stickers. It then went to 22, with another 22 possible, then more and more of the possibles were uncovered. It was thought 44 would be the upper limit but the Stirling book had 66 known as of 1977. That is far more then have been checklisted. I must say it is unusual for something this close to Topps printer's scrap to have entered the hobby but this set has a number of partials known, not just ol' Smokey. 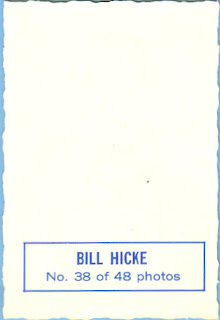 While other backs have been seen with printer's proof bar colors "rolled" around onto the backing. I'll keep digging for the full checklist on this set. There is a Net54 thread on this set here and it has probably the most current checklist around. It's well worth a look. I would guess no more than 2-3 copies of each sticker can be found, if that. I am telling you, the more you look at the Topps Punchboards, the more confusing things get! Just when it looked like the 66's were sussed out, along comes a mystery man who expands the set count by 40-some-odd-percent. Then you get a ton of details on the 67's (much more on this below) and think you have that particular set figured out when in comes even more information. Egads! 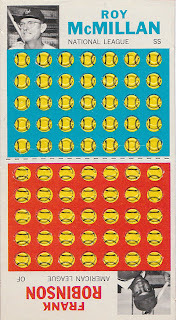 Well, enough kvetching......let's talk 1967-ish Topps Baseball Punch-outs! After what looks like a full production ramp up that was killed just before test marketing in 1966, Topps revamped and greatly (understatement of the year) expanded the offering for 1967. 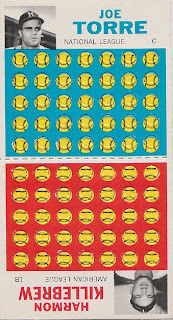 Whereas we have 14 cards featuring 28 players in '66, the 1967 Topps Punchboards (or Punch-Outs, the wrapper and card backs differ) were sent off into the Summer of Love with a possible 86 players and just under 200 permutations presented in crisp, elongated cellos and mysteriously distributed wax packs. "Nearly 200" different lineup cards is the veritable truth. 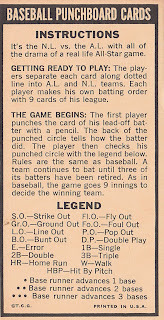 Veteran Topps test collector Larry Serota has been tracking this set for years and has some significant observations. He has found there are 86 Team Captains and 195 different lineups. Good grief! When you consider this is a set that is only a step up from a typical Topps test issue in scarcity (it was likely issued in a few, select locales), Larry' s collection of 192 out of 195 possible cards is one of the more amazing hobby feats I can recall. We'll get back to the cellos later. That would be a red AL card under the middle of the wrapper and presumably the other strip below it would reverse the pattern. 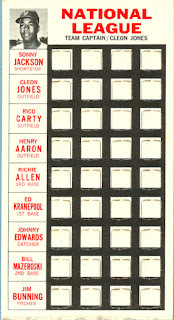 What Larry is getting at is that the lineups do not repeat on different panels, which is a remarkable feat of design by Topps when you get down to it. Yes, there are three pose variations: Frank Robinson as a Red (almost certainly an honest mistake) or Oriole, Matty Alou facing left or right and Roberto Clemente with a slice of stadium behind him, or not. These all are three lineup players. There are also cropping differences in some of the Team Captain photos. All of this is reflected in the lineup counts. If you are keeping score at home there are 14 Team Captains with a single lineup, 41 with two, 25 with three and 6 with four. The five cards shown as N/A are bonafide red herrings according to Larry. Grote's asterisk indicates he never should have been on the Standard Catalog checklist (my bad, I actually caused that error) which leaves the thorny issue of Brooks Robinson, Campy Campaneris, Bob Gibson and Roy McMillan. I am warning you now, I am making some serious guesses on the manner of distribution from this point forward. Gibson in particular has vexed collectors for years but appears to be chimerical, as do the other missing Captains. If you discount McMillan, who appears in the '66 set and could be a mistake on an old checklist, that leaves B. Robby, Campy and ol' Gibby as orphans on the list. Larry feels they do not exist, as do other advanced collectors. He does concede they could all be part of a single panel, which fits the observed lineup phenomena as it would appear they are not on any other lineups. It would also give us 66 three card panels, which would be a righteous number in the Topps universe, but I merely speculate. Each of these three would be a single lineup Captain if actually printed, I have to think. That is a rare wrapper friends. Rumor surrounding this set is they were issued in the Baltimore area. 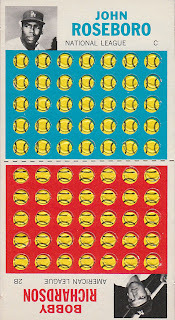 I have long thought certain odd-sized Topps test issues were printed in Bawlmer; I lean towards the Punchboards in that regard. The kicker to all this is that John found evidence the ten cent cello packs were marketed in 1968. This could explain the persistence of hobby wisdom that this was a '68 issue. This flat though, clearly shows a March 1967 proofing process for wax. Looks like a multi-year issue is a distinct possibility, which could account for our three pose variations and cropping differences. I also wonder if Team Captains with three and four lineups beneath them were reprinted for the '68 season. No real way to tell at this point but it's an intriguing idea. Topps must have had huge plans for this set but it most certainly did not sell well. While it may have satisfied Sy Berger and Woody Gelman's nostalgic impulses, it does not seem it caught on in '67 or '68. You can find these cards with some digging, although major stars and single-lineup captains will run you quite a bit of dough. 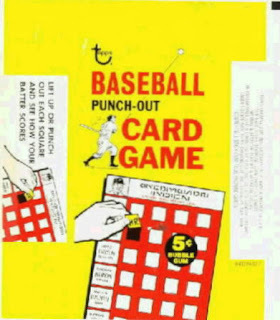 Punched out cards can also be had, for a fraction for the cost of intact boards. Personally, I think this is a great set! 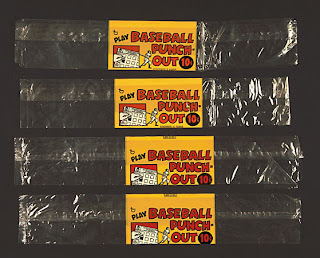 If you have been following the comments about my last post, there is a bit of friendly debate going on concerning packaging of the '66 Punchboards and tangentially the 67's. While I will get to a review of 1967 set and its intricacies soon, I figured it would be easier to jump the gun and show what scans I have nicked along the way of the 67's packaging. There will be some updates on the 66's as well, so consider this a "catch up" thread. Now the box says a nickel and clearly shows a '67 card. 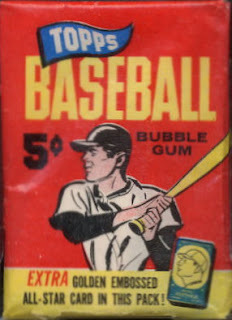 My 2nd edition of Mark Murphy's Unopened Pack guide states that the wax pack sold for a dime and held three cards, so something is either amiss or Topps used two price points for the '67 wax. 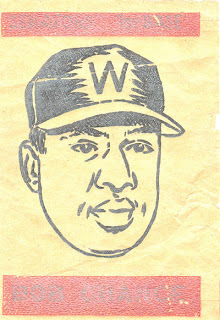 If anyone has a scan of the '67 wax wrapper, send it along and I'll update this thread. "Incredibly it was a normal standard fully-printed wrapper - not a blank white wax wrapper with a sticker - I always thought this was amazing because with this style of printing they must have printed many, yet all I ever saw was the one. 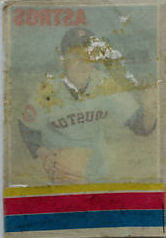 I had the top of the box also, which as I recall also pictured the same Mantle card." "I'm not sure I fully answered your question: It certainly was not a cello wrapper, but I'm not 100% sure it qualifies as a "wax" wrapper though it may - It was printed on a strong paper stock. 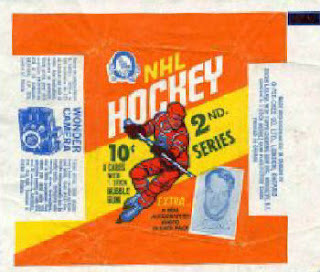 I remember that the wrapper appeared to have been "sealed" with a piece of tape on the reverse - sort of like someone had actually just taped the pack shut by hand. " We'll see what else turns up. 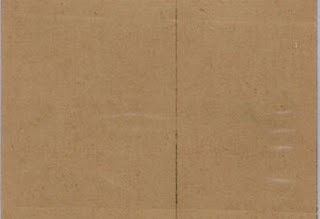 UPDATE 3: I have been advised by an advanced Topps collector that at least five of the '66 Punchboards are known with blank backs. I am not certain if the 14 I have shown previously all have printed backs or not, so stay tuned as I await details from both fronts. 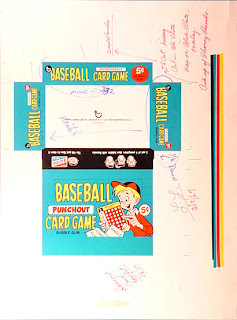 UPDATE 4: Friend o' the Archive John Moran just sent me a scan of an annotated '67 box proof. 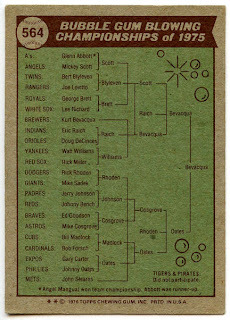 The dating is March 7, 1967 and it was from the Topps vault (click to enlarge). The handwritten Phoney Records reference is intriguing. Goodness! 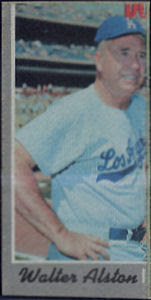 UPDATE 5: Topps enthusiast Larry Serota advises the five blank backed 66's were: Koufax, Mays, Stargell, Flood, Callison. Awaiting word if singles or full panels.....Thanks Larry! UPDATE 6: The five blank backs were full panels. 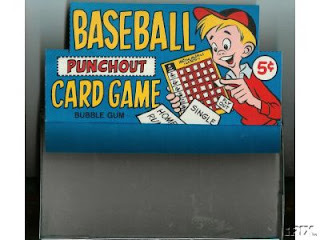 Last year I posted about a very rare Topps proof set from 1966 commonly referred to as Punchouts but technically known as Punchboards. Since then, I have been receiving e-mails and scans from a gentleman (who shall remain nameless at his request) who inherited a small cache of these. After going through his stash he has managed to add 9 players, or 4 1/2 full cards, to the known checklist. He has also been kind enough to provide scans and I thought this would be a great time to show a visual checklist of the set and discuss some of its slowly revealed nuances. 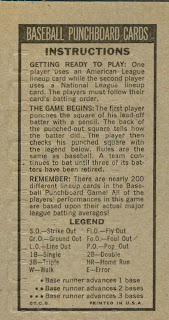 As it stands today, the known checklist is comprised of 14 full two-card panels featuring 28 players. For reasons I will get into below, I do not believe this to be a complete checklist, although it may be close. Here is the latest, in alpahabetical order by the name of the NL player shown on the card (each has one NL and one AL player). As you can see, the distribution of teams is not even and some are missing. Five teams remain unaccounted for: one from the NL (Astros) and four junior circuit teams (Angels, Athletics, Indians & Senators). 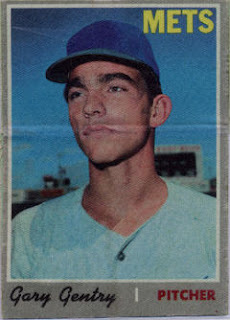 The Twins, participants in the 1965 World Series along with the Dodgers, have four players in the set while the Giants, Red Sox and Yankees have three apiece. The Dodgers, Cubs, White Sox and Pirates net two players and the remaining known teams have a sole member represented. A definite pattern emerges here. The six "infield" positions each are represented by no more than two players per league, while the outfield slots top out at five. If we were to add two NL second baseman to the mix, we would need at least an extra card beyond 18 (assuming one of them was on one of the four theoretical cards added to round out the team distributions). 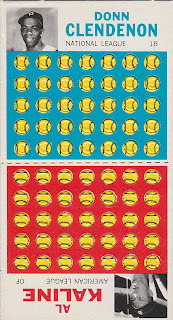 19 is a very unwieldy number for a small Topps set (although not impossible as the 1968 Plaks have shown) but there is yet another clue, which is the uncut sheet configuration. Now, if the cards were oriented differently then the distribution could change as a bottom right corner could become an upper left, etc. and I also do not know if more then one middle column was printed. 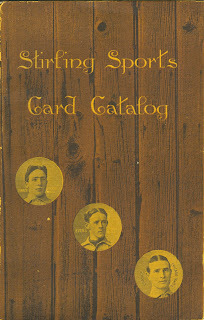 Another complicating factor is that two to four copies of each card may exist as our mystery man has two copies of some and I have identified a couple myself from other sources. In addition, Topps would usually keep one or two reference copies, two of which have been known for a while (Marichal/Rollins and Roseboro/Richardson). It's enough to drive you batty! 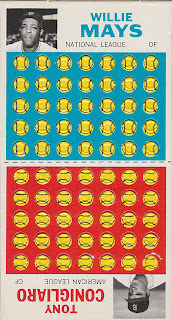 What is clear though is that no card has four sides with nubs so two rows high looks to be as tall as a sheet can get. What does this tell us then, other than the fact I am clinically insane? Well, it might mean there are 30 cards in the set (5 sheets of 6 cards each) or that maybe there are only three sheets of either six or eight cards apiece (if there were two middle columns). A yield of 18 works if you eliminate one of the missing NL 2B positions and add four cards as discussed above but I don't like the missing NL 2B position if you do that, as I have to believe the 2 players per league per position for the infielders is a set figure. You can get a nice distribution with 24 cards/48 players though if you assume there could be 8 pitchers, 10 infielders (excluding pitchers) and 6 outfielders per league which would also allow for common multiples of 4, 6 and 8 but that is adding a lot of cards and my source thinks he has most of them. But what if there three middle columns giving us 10 cards on a sheet and there were two sheets? Two more pitchers (balancing lefties and righties at two each per league), two infielders per non-pitching position (10 total) and six outfielders per league would certainly fit the pattern (even moreso if you assume 2 each of LF, CF & RF) and give us 20 full cards (4 pitchers, 10 infielders and 6 outfielders) while filling in all the positions and teams. But then there are too many corner pieces (at least three bottom rights or top lefts depending upon orientation). Aaaargh! Adding up those puzzled out permutations gives a possible 36 cards/72 players at a minimum, which seems excessive to me. Given all this, I am going with the 20/40 count for now as it jibes nicely with the two-per-position theory and necessarily assume there were some double prints created, but this is not iron clad. Some of the nubs and edges have been trimmed off since I cleaned up the scans a little. I can assure you no nubs were harmed in the production of this post. You will note Frank Robinson's airbrushed cap, no doubt a result of his trade from the Reds to the Orioles on December 9, 1965. 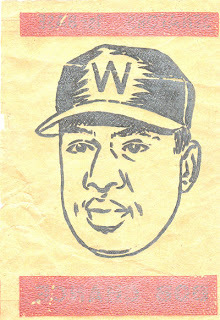 Since he is shown as an AL player, the cards had to be produced after that date. It is also worth noting Joe Torre is depicted in a Milwaukee Braves hat as the team moved to Atlanta for the 1966 season. I would guess therefore it was a late December '65/early January '66 production cycle for these cards. 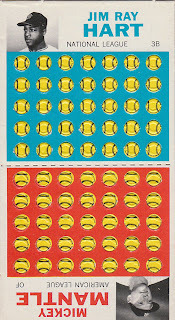 The problem was you needed nine cards each to play the game, which is way too many cards to obtain a dime at a time before you could even start properly poking holes in the cards! 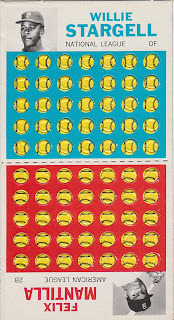 The re-jiggered set as issued at retail in 1967 allowed you to use a single card each with a lineup of players on it, a much more realistic scenario for game-playing purposes. 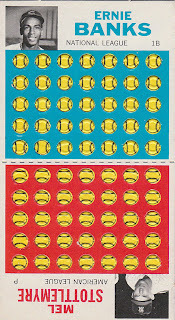 Still, these '66 Punchboards were almost finished products, with the possible exception of a score line to separate the two halves. I would love to see a wrapper proof someday; Rob Lifson believes he once had one from Woody Gelman's archives that featured Mantle on it, much like the box flat. I do expect some more players to be uncovered though; time will tell if my prediction of 20 full cards proves right. Following last episode's star-studded 1969 Baseball Deckle insert extravaganza, there is still a deckle insert from north of the border to discuss.